Are You Ready for Some Football? Tailgating is a perfect time to invite some friends to join the pre-game excitement. So, how do you prep and pack to make sure you have a successful tailgate party? Here are my top five tailgating tips on how to organize in advance so you can maximize on the fun when you arrive! 1. Prep and Organization are the Keys! Save Time for More Fun: Space is tight when you set up for a tailgate so organization before you get there will save a ton of time and allow you to spend more time having fun versus fishing through boxes and bags looking for the things you need. Tailgating Tip: Use a plastic 4-drawer cart to keep all of your tailgating necessities organized and easily accessible, plus you won’t have to unpack anything at the game or at home, you simply take the cart out of the car and voila! Once you are home, simply take the cart back out of the car to store it in the garage or a closet and it’s prepped and ready to go for the next time! 2. Tailgating Tip: Pack an empty plastic bin so you can pack up all of the dirty dishes and tools that need to be washed when you get back home. That will keep these items separate and protect your car from getting dirty. Burgers – prep in disposable aluminum foil pans and lay the burgers on sheets of waxed paper so all you have to do is take them out and pop them on the grill! 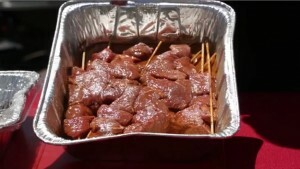 Shish-kebobs – skewer your kebobs the night before and place them in a disposable aluminum foil pan, add marinade and refrigerate. They’ll be ready to throw on the grill as soon as you arrive and the grill is hot. Mini- Megaphone in Team Colors of Popcorn or Chex Mix – Plug the hole at the bottom with a ball of aluminum foil and then package the portion in a ziplock bag the night before. Once you arrive simply pour and set it out. 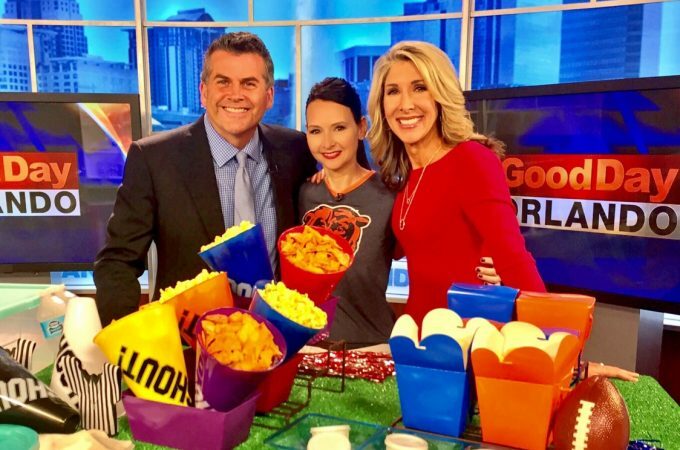 Guests get a great snack and a fun prop to take to the game! 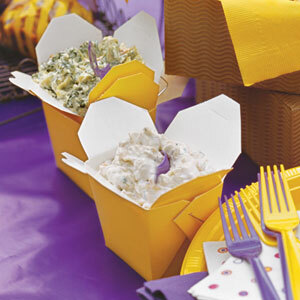 Chinese Container Chip and Dips – I love chinese containers for portioning out snacks or food. They are perfect for picnics and tailgating. I recommend lining them with plastic wrap so the oil from the chips doesn’t saturate the cardboard and then fill with your favorite chips. Fill individual condiment containers with a couple of your favorite dips, snap the tops on and then set them on ice when you arrive. 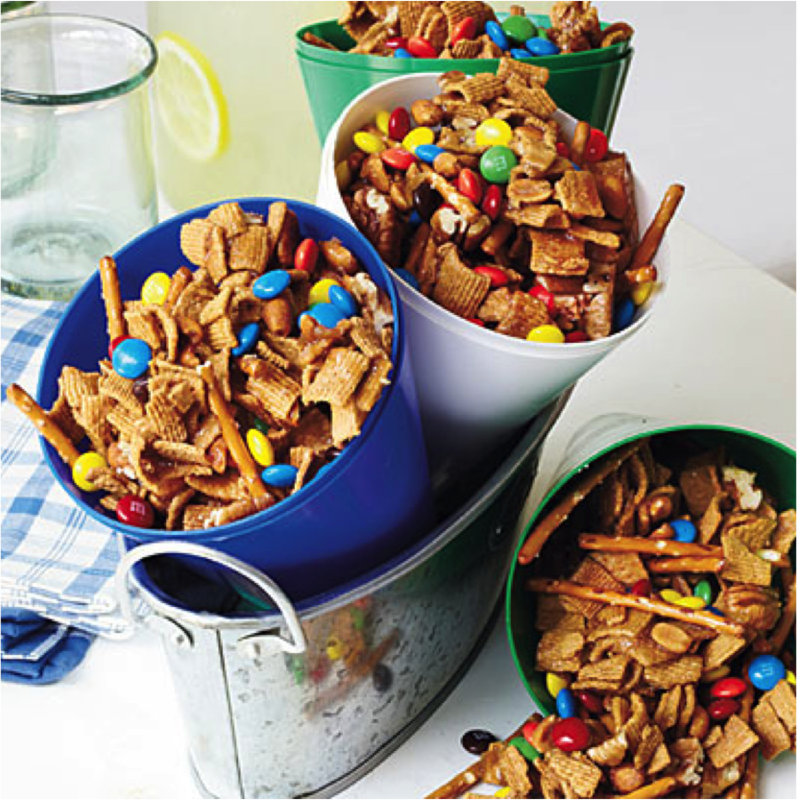 Guests can grab a container of chips, pick their favorite dip and not have to juggle spooning items on to their plates! They love it! Alcoholic Beverages – I think it is always fun to theme a drink you can make in batches in team colors or pick a local IPA brew from the cities of the teams if you can! 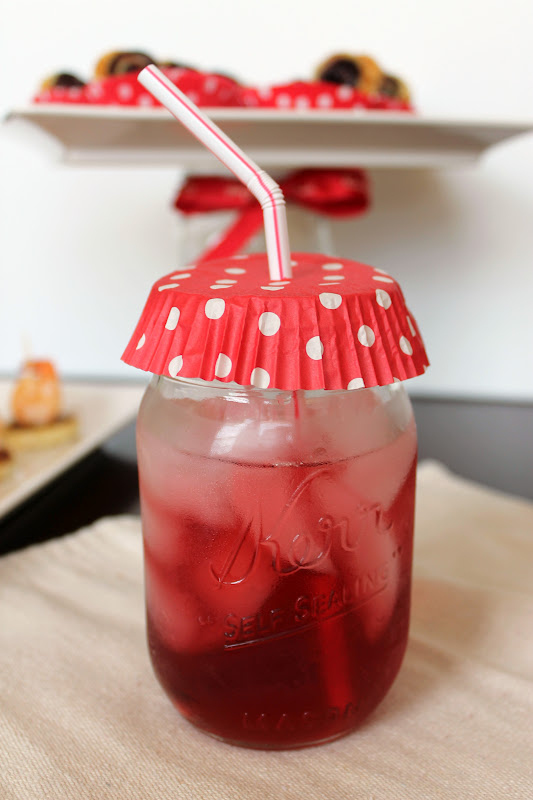 Pack them on ice and voila… Tailgate Tips: Flip cupcake holders upside down over your drinks to keep the bugs out and Drinks will chill quicker in the cooler if you also add some water to the ice. 5. 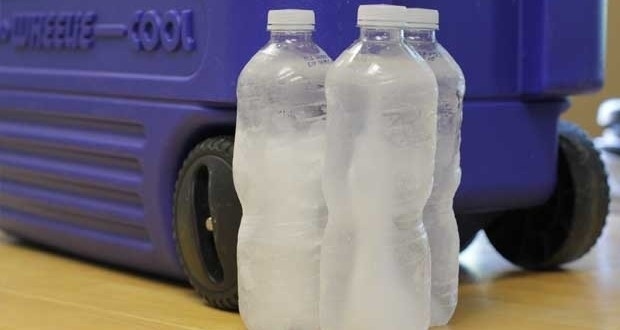 Tailgating Tip: Freeze water bottles the night before and use them as a source to keep your food cool on the way to the game. As you are enjoying your pre-game time, the waters will start to melt and you’ll have cold water to drink. It’s a double-duty tip to maximize space and mulit-use items! Table Cover: If you want to embrace the spirit of bringing the football field to the parking lot, use a new outdoor textured grass rug as a table cover for your table. You can purchase a 6’ x 8’ rug at a Home Improvement store like Lowes for just $18. And, in the perspective of re-purposing and re-using items if you buy them, save it and then you can re-use it to set a Spring Celebration or Easter table in the new year!